Yawara Martial Arts: Judo Gradings at Bu'sen in December 2013 for our students attending Judo classes. 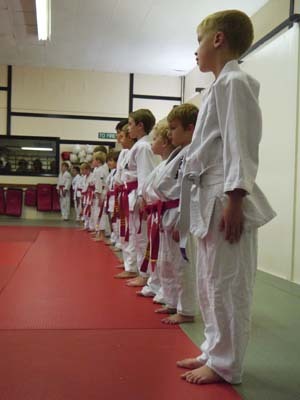 Gradings generally take place every 3 months for beginners through to 1st Kyu grades. One of these gradings will be held on SUNDAY 1st DECEMBER 2013. The grading is for all students with the necessary hours (minimum 20 hours). Novices (White belts). Under 10 years. Red belts. Under 10 years. Red belts with Yellow and Orange Stripes. Under 10 years. Red belts with Green, Blue, Brown, and Black Stripes. Under 10 years. Over 10 - 12 years. Your First class at a Yawara Club is free, so don't hesitate contact us today... We run Judo classes in London (Wandsworth), Woking and Lightwater. Check out some pictures from the grading at Bu'sen in September 2013.